Originally they were called Ritchie Blackmore's Rainbow and were formed in 1975 after the band's leader quit Deep Purple over 'musical differences.' Since then Rainbow have recorded seven studio albums yet no two albums has had the same set of musicians record them. Having formerly been in The Outlaws in the 1960s before becoming a founder member of Deep Purple, Blackmore was one of the first musicians in Britain to forge an alliance between rock music and Classical influences. Among those who have been in the band are Ronnie James Dio, Graham Bonnet and Joe Lynn Turner on vocals, Roger Glover also formerly of Deep Purple on bass and drummer, Cozy Powell. Among the most successful albums, although all have made the UK charts, was 1979's Down To Earth which included one of the band's best known songs, Russ Ballard's 'Since You've Been Gone.' In 1981, Difficult To Cure made No.3 in Britain. The brainchild of former Deep Purple guitarist Ritchie Blackmore, Rainbow quickly developed into one of the '70s most successful heavy metal bands behind charismatic front man Ronnie James Dio. Together, the duo would produce a string of acclaimed albums which are still considered classics of the genre. But the group would change their musical approach numerous times following the singer's departure, eventually confusing and alienating much of their audience. Releasing eight albums during it's decade long run, the band finally came to an end when Blackmore departed to rejoin his old Deep Purple comrades in a full-fledged reunion in 1984. And while the impact of Rainbow's influence has faded with the intervening decades, theirs was a crucial chapter in the development of heavy metal and hard rock. Disillusioned and fed up with the chaotic state of Deep Purple in the mid-'70s, guitarist Ritchie Blackmore made the stunning announcement in May of 1975 that he was quitting the group he had founded and led for over seven years in order to start from scratch. 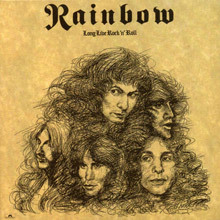 Teaming up with up-and-coming American vocalist Ronnie James Dio, Blackmore built Rainbow around the singer's former band Elf, minus their guitarist David Feinstein. Featuring bassist Craig Gruber, keyboard player Mickey Lee Soule, and drummer Gary Driscoll, the group's 1975 debut Ritchie Blackmore's Rainbow was quickly embraced by European fans and yielded their first hit single, "Man on the Silver Mountain." Blackmore and Dio were dissatisfied with the album's sound, however, and decided to re-vamp Rainbow (by then sufficiently established to do without Blackmore's name) by drafting bassist Jimmy Bain, keyboard player Tony Carey, and former Jeff Beck Group drummer Cozy Powell. It was with this lineup that they entered Musicland studios in February 1976 to record the landmark Rising opus -- once voted the greatest heavy metal album of all time in a 1981 Kerrang! magazine readers' poll. Capturing Blackmore and Dio at the peak of their creative powers, Rising chronicled both the guitarist's neo-classical metal compositions at their most ambitious, and the singer's growing fixation with fantasy lyrical themes -- a blueprint he would adopt for his entire career thereafter. Following its release, the band embarked upon a successful world tour, culminating in a sold out European jaunt which spawned a best-selling live album entitled On Stage, released in 1977. By the time they returned with the equally acclaimed Long Live Rock'n'Roll album in 1978 (featuring bassist Bob Daisley and keyboard player David Stone), Rainbow had established themselves as one of Europe's best-selling groups and top concert draws. But the volatile relationship between Blackmore and Dio had already begun to deteriorate, as the American-born singer became increasingly frustrated of standing in the guitarist's shadow -- even in his own country, where the group was now fully committed to breaking big. To make matters worse, Blackmore had been so impressed with "Long Live Rock'n'Roll"'s success as a single, that he began to consider altering the band's sound in order to pursue a more mainstream hard rock approach (a direction which Dio wanted no part of). A chance meeting with Tony Iommi of Black Sabbath (only recently divorced for good from unreliable front man Ozzy Osbourne) helped the singer make up his mind, and Dio officially quit Rainbow in early 1979 to join the Sabs. Finding a suitable replacement for the charismatic singer proved a serious dilemma, and when Blackmore eventually recruited former Marbles vocalist Graham Bonnett, his decision came with an all-around re-tooling of Rainbow's sound, not to mention, once again, the band's membership, which now included former Deep Purple cohort Roger Glover and keyboard player Don Airey. With the release of 1979's Down to Earth, gone were the mystical themes and epic metal compositions, replaced by a more streamlined commercial hard rock style. But despite containing two of Rainbow's biggest singles, "All Night Long" and "Since You've been Gone" (the second, written by former Argent singer Russ Ballard), the album sputtered in stores, selling far less than the group's previous, Dio-fronted efforts. Bonnett also failed to meet Blackmore's lofty expectations on stage, and after a single, disastrously drunken performance at the inaugural Castle Donington Monsters of Rock Festival in the summer of 1980, the singer was unceremoniously given the boot. Once again strapped for a vocalist, Blackmore found his man in American singer Joe Lynn Turner, who along with new drummer Bobby Rondinelli signaled a true career rebirth for Rainbow. Wishing to shed the group's overblown, Dio-associated Euro-metal sound of days past once and for all, the new Rainbow lineup was made to order for another bid at widespread acceptance in America. The first product of this new direction, 1981's well received Difficult to Cure helped the group regain some of their momentum and yielded their highest-charting single ever, another Russ Ballard-penned track entitled "I Surrender." In fact, the record's title track -- a sprawling, ten-minute metallic blitzkrieg through Beethoven's Symphony No. 9 -- was the only throwback to Rainbow's highbrow metal origins. 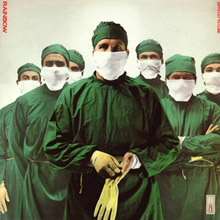 Released in 1982, Straight Between the Eyes failed to chart any successful singles, however, and the band's appeal began to nose-dive, along with Blackmore's increasingly uninventive, risk-free song writing. 1983's Bent out of Shape (featuring new members in keyboard player David Rosenthal and drummer Chuck Burgi) fared no better, and after accepting the fact that Rainbow's best days were behind them, Blackmore finally relented to take part in the long-rumored and hoped for re-formation of Deep Purple's classic Mark II lineup. Typically, the guitarist refused to go out quietly, and Rainbow were backed by a full symphony orchestra for their final March 1984 performance in Japan. A posthumous live release, entitled Finyl Vinyl, was compiled in 1986, and though he would briefly resurrect the Ritchie Blackmore's Rainbow moniker after quitting Purple for the second time in 1994 (even recording an album called Stranger in Us All), this incarnation would be short-lived. Blackmore was last heard from performing with his purported fiancé Candice Night in the medieval folk duo Blackmore's Night. 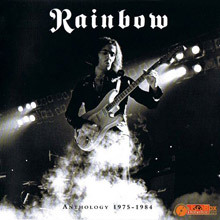 Perhaps the first example of "dragon rock" -- a style perfected by bands like Iron Maiden and Dio in the early to mid-'80s -- was Ritchie Blackmore's Rainbow, a rather pretentious 1975 collection from the guitarist's first post-Deep Purple project. Fittingly enough, a young Ronnie James Dio provides the goblin-like frontman presence required by the increasingly Baroque Blackmore. The young Dio is at his best when he fully gives in to his own and Blackmore's medieval fantasy leanings, in hard-rocking tracks like "Sixteenth Century Greensleeves" and "Man on the Silver Mountain." The dark, trudging doom rock of "Self Portrait" most clearly showcases what they were capable of. The album's ponderous lyrics are occasionally punctuated by poetic phrases such as "crossbows in the firelight." 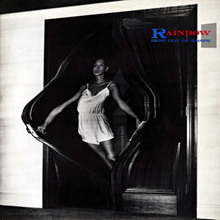 On their second release, Rainbow not only avoid the sophomore jinx; they hit a home run. 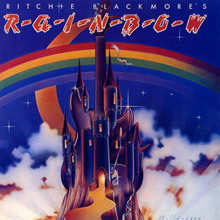 After replacing the entire band (except Ronnie James Dio) immediately following the recording of the first album, Ritchie Blackmore and the Rising lineup (Blackmore; Dio; Tony Carey, keys; Jimmy Bain, bass; and the late, great Cozy Powell, drums) had plenty of time on the road touring the first album to get the chops and material together for their second. In particular, "Stargazer" really came together on the 1975 tour and featured stunning keyboard work from Carey. The material is uniformly strong, with "Starstruck" and "A Light in the Black" standing out in particular. Ronnie Dio turns in a great vocal on the stunningly direct (under three minutes!) "Do You Close Your Eyes." All six songs on the album are up there with anything the band has done, before or since. The playing has a very tight, colorful feel to it, which was lacking a bit on the first record. This album can legitimately be mentioned in the same breath as classic Deep Purple. The departure of Ronnie James Dio gave Ritchie Blackmore a chance to reinvent Rainbow, which he does to a certain extent on Down to Earth. Adding former Deep Purple colleague Roger Glover as bassist and Graham Bonnet as vocalist, Blackmore tones down some of the excess of the Dio years, particularly in terms of fantastical lyrics, and turns to straight-ahead hard rock, only occasionally adorned by prominent synthesizers. In general, their material is fairly solid, and "Since You Been Gone" easily ranks among the band's best songs, but overall the record is a little generic and sounds very much of its time -- namely, the late '70s, when album rock still ruled the arenas. Nevertheless, Rainbow has a distinct idea, primarily through the guitar artistry and mystical sensibility of Ritchie Blackmore. He sounds invigorated on the album, turning in muscular performances and strong solos on each cut; clearly, the reunion has revitalized him. Unfortunately, Bonnet tends to oversell his vocals, screaming a little bit too often, but he doesn't distract from the fact that Blackmore, Glover, and drummer Cozy Powell turn Down to Earth into a fine hard rock platter. It might not offer anything unique, but it delivers the goods. 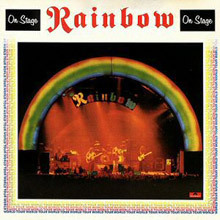 Breaking with '70s heavy metal tradition by releasing a live album after only two studio efforts (you're supposed to have three before the live one), Rainbow served up this double platter in 1977. On Stage is full of great songs and playing, but somehow it lacks some of the excitement that existed at those early Ritchie Blackmore concerts. The production is just kind of flat. That doesn't change the fact that there is some great material to be found here and nowhere else, such as the side-long version of "Mistreated," from Deep Purple's Burn. Similarly epic is a version of "Catch the Rainbow" containing some awesome guitar work -- although it's a little too long for its own good. In another break with metal tradition, the album kicks off with "Kill the King," a blazing rocker from their next platter, Long Live Rock 'n' Roll. (The idea of opening your show with a song no one knows is very foreign to both heavy metal and double live albums.) On the band's classic song, "Man on the Silver Mountain," Ronnie Dio cries out in his over-the-top vocal finale, "I'm the man, I'm the man, I'm the man....we're all the maaaaaaaaaannnn." That is unconsciously funny enough to make the disc worthwhile all by itself. Long Live Rock 'n' Roll may be singer Ronnie James Dio's last album with Rainbow, but at least he went out on a high note. While the material is not quite as strong as on the previous studio effort, Rising, Long Live Rock 'n' Roll maintains the momentum the band had built up. "Kill the King" had been previously heard on the live On Stage record, but here it sounds more fully realized. Also, the title track from the album stands as one of the best songs the band did, not to mention a noble sentiment. The chugging "L.A. Connection" is another highlight. As with all of their first four albums, this one was produced by Martin Birch (who produced everyone from Blue Öyster Cult to Wayne County), and he really knows how to get the best out of the band by this point. The result is that the songs couldn't sound any better, so even if some of the material isn't quite up to their best, the album is still very cohesive, steady, and, ultimately, satisfying. 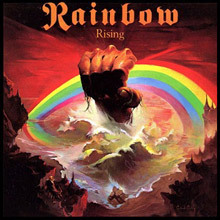 This would turn out to be the last great album Rainbow would ever make, although they did enjoy a great deal of chart success in the post-Dio era. Straight Between the Eyes undoubtedly has one of the worst album covers in rock history, but the record is an unexpected return to form from the journeyman hard rockers. Just a record before, Rainbow sounded as if they were verging on Billy Squier territory, but here, they reverse course and deliver a solid, no-frills hard rock record. It isn't just that the material is stronger, though it certainly is, it's that Roger Glover abandoned his smoothed-out, radio-ready production that marred Difficult to Cure. 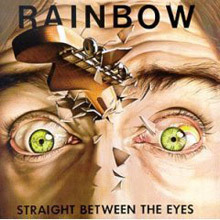 That's not to say that Straight Between the Eyes doesn't sound dated -- Rainbow was a band that was forever tied to its era -- but the album does have a harder-hitting, muscular sound that is more appropriate for the band. Similarly, vocalist Joe Lynn Turner sounds more comfortable with the group, and the entire band just seems to gel, turning even the generic numbers on the album into enjoyable, straight-ahead hard rock. There may not be any specific showcases for Ritchie Blackmore, but his playing is better heard in this setting, where he's not only soloing, he's propelling the band with his powerful riffs. As always, he's the driving force behind the band, but this is truly a band effort, which is one of the reasons why Straight Between the Eyes is one of the strongest albums the group ever cut. 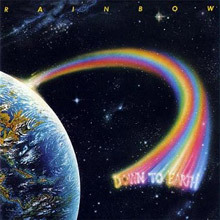 With Joe Lynn Turner on board, Rainbow tried one crossover record and one no-frills hard rock record -- which meant that Bent out of Shape, their third album with Turner, provided a fine opportunity to get a little arty. Not that the band has turned into Genesis or even returned to the mystical pretensions of its early work; they have merely broadened their horizons. Ironically, that means that they've retreated, at least partially, to the radio-ready sound of Difficult to Cure, but this time, they aren't just trying for a crossover hit. As producer, Roger Glover has widened their sonic horizon without losing sonic muscle, making sure that the album is, at its core, hard rock. His production works, since the record hits pretty hard even when it gets a little fruity, which it does quite often -- the stately, silly church organs that "Can't Let You Go," the fugue-like cadences of "Fire Dance," the mock-classical instrumental "Anybody There." Those instrumental flourishes highlight Bent out of Shape's true strength, which is its sonics -- the record sounds good and the music flows well. 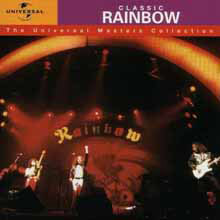 This 16 track compilation released in 2001 features the standout tracks from Rainbow’s career. These include ‘Since You’ve been Gone’, ‘I Surrender’, ‘Long Live Rock n Roll’, ‘All Night Long’ and ‘Stone Cold’ The band has sold over 28 million albums worldwide and 4 million albums in the US; this collection shows you why. This 2009 two CD set showcases both sides of Rainbow. The metal band with almost folk like overtones and the more straight ahead radio friendly rock sound beloved by America. It includes, ‘Man on the Silver Mountain’ and it is one of the best that Ritchie Blackmore and Ronnie Dio ever did together. Most of the expected Rainbow classics are included on Anthology and if you are looking for a place to start your exploration into Rainbow’s back catalogue this is a great place to start.